Local friends Fallen Fruit have an exhibit called Fallen Fruit: United Fruit, and it's all about Bananas! It's going on now at the LACE gallery in Hollywood. Apple Brains is gonna check it out tomorrow and will give a report! "Get Fruity!!" review: "One of the best kids' albums of 2009, and definitely one of the most unique!" Warren Truitt from the Kids' Music That Rocks blog wrote a fructose-y sweet review of Get Fruity!! It's quoted below, or click here for a direct link. 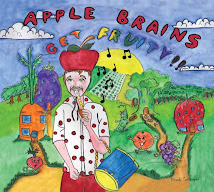 "With the innocent enthusiasm of Jonathan Richman, the eclectic inventiveness of Mr. David, and the general kookiness of The Bonzo Dog Doo-Dah Band, Apple Brains bursts upon the kids' music scene with their debut album Get Fruity!! L.A.-based Allen Bleyle is the brainy apple behind Apple Brains, and his free-for-all, lo-fi, indie rock style is a refreshing addition to the children's music world. Get Fruity!! is a concept album of sorts, with every track highlighting fruits, vegetables, water, and healthy eating in general. But this isn't a preachy, stick-in-the-mud, instructional album by any means: Peanut Butter and Jelly show up as characters who tell the story of how they met; a little girl carries around a mango like a baby; a little boy weeps at the wonderfulness of tomatoes. Far Out! Get Fruity!! kicks off with the sunny anthem "Apple x3," which begins as a cheerful ode and ends as a manic scream-along, followed by the awesomely weird story tune "Peanut Butter and Jelly How They Met Song." A wobbly melody line carries "Water the Loveliest Beverage," a tune that's half informational and half tribute, then comes the ridiculously catchy (and informative!) rave-up "Ba-na-nas." The hyper-enthusiastic sing-along "Lots of Different Colors" describes the many hues of fruits and vegetables, while "The Stone Fruit Salute" celebrates peaches, plums, cherries, and apricots with a waltzing carnival-like sound of pump organs and slide whistles. The indie pop "Growing Like Crazy" features a kazoo/keyboard sound effects solo while describing the things that help us grow, and a laid-back island groove carries the mango-worshiping tune "A Mango is a Precious Egg to be Cherished." The bilingual "Frutero" describes looking for something good to eat while walking around Los Angeles, while the brilliantly Ween-like "Tomatoes are So Wonderful That They Make Me Want to Cry" is pretty much what the title tells you, a tune that definitely needs to find its way onto The Dr. Demento Show. The entire album features guitar work by Kyle Thomas, highlighted by the goofy acid rock of "Wonder Worm," while the key-shifting "Each and Every," a song about seeds and plants, ends the album with a laugh-out-loud verse courtesy Lucia Turino. Now, all these songs might seem a little silly, but Bleyle is serious about his enthusiasm for good eating. Check out his gushing blog post about Adam Leith Gollner's book The Fruit Hunters, and find out how it was the inspiration for one of the Apple Brains songs. And Bleyle gets indie cred with the roster of musicians used on Get Fruity!! : members of The Devil Makes Three, Feathers, Pretend You're Happy, and Witch (Dinosaur Jr.'s J. Mascis' side project) help sing and play on the album. Get Fruity!! on "Kids Music That Rocks" Blog!